First a few words about this project the motivation, the technologies involved and the end product that we’re going to build. I’ve personally used this weather station to collect data (you can download the data in the next steps if you wish). With only about 600 days of weather data the system can make a prediction if it will rain or not in the next 6 hours with an accuracy of around 80% depending on the parameters which is not that bad. This tutorial we’ll take you through all the necessary steps to predict rainfall from scratch. 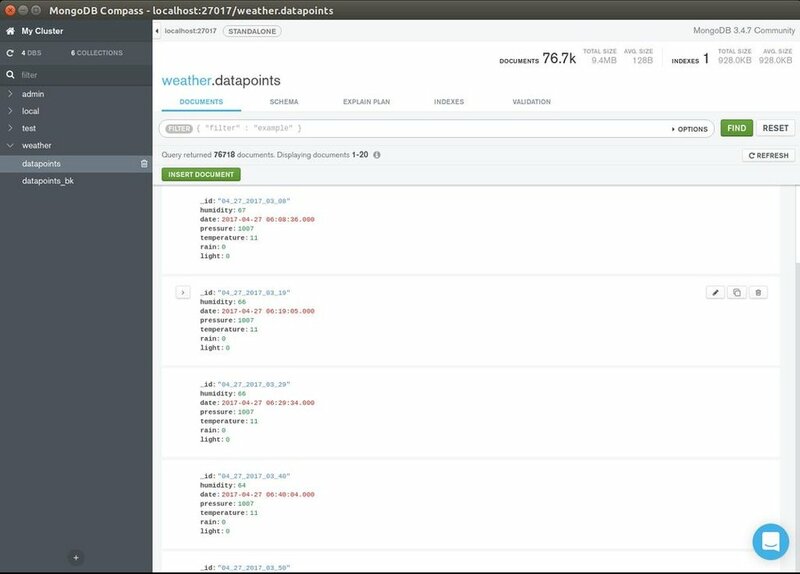 We’ll make an end product that does a practical job, without using external weather or machine learning API-s. We’ll learn along the way how to build a practical weather station (low power and off the grid) that really collects data over long periods of time without maintenance. After that you’ll learn how to program it using Arduino IDE. How to collect data into a database on a base station (server). 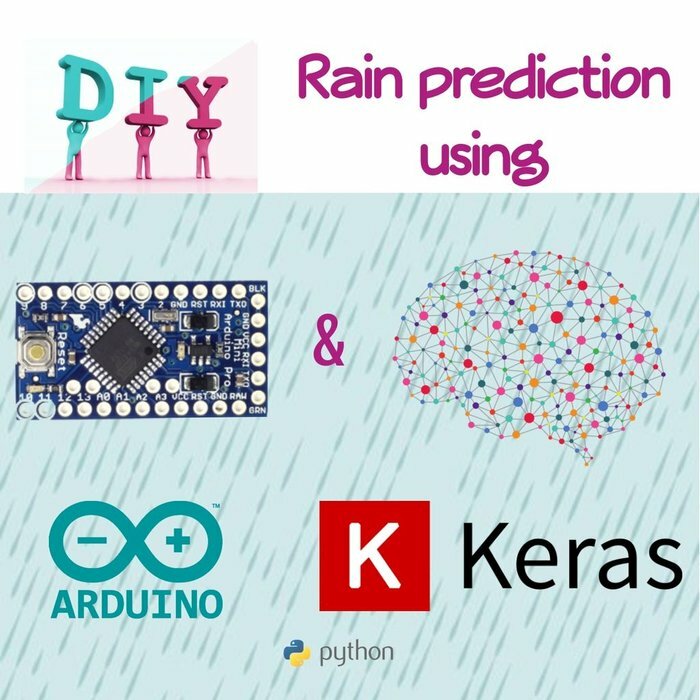 And how to process the data (Pandas) and apply neural networks (Keras) and then predict the rainfall. The final thing it would be to place the station to it’s final position. I’ve chose a position that is sheltered from the rain and snow. I’ve chosen longer wires for the rain sensor and placed it separately in the rain on a steady support. For the main box i’ve chosen a special kind of tape with adhesive (check the pictures) but anything that holds the box will do. 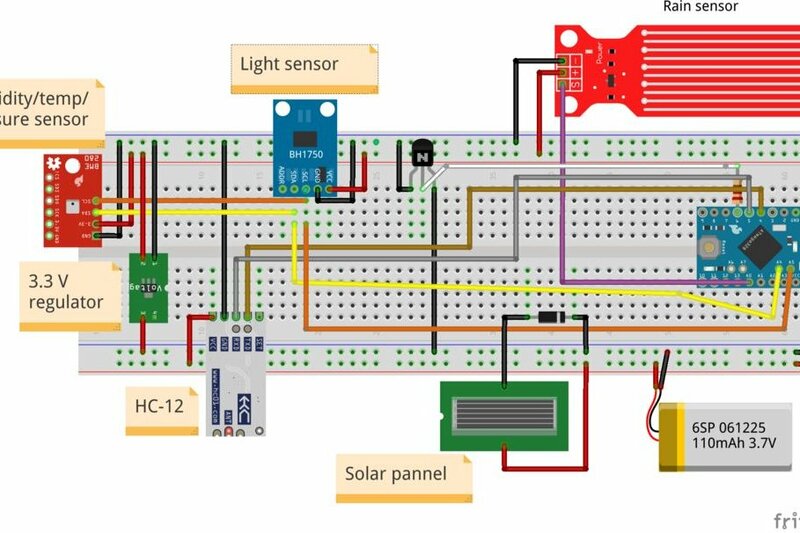 In this step you’ll learn what external libraries are needed, we’re overview the code and how it works and of course you’ll get to download it or copy-paste it into Arduino IDE and upload it to the weather station. The role of the weather station is to transmit to a base station every 10 minutes data about it’s sensors. 2. transmits the encoded data through a second software serial line. One little extra tweak here, if the voltage level is above 4.2 V the arduino will use the normal sleep function “delay(milliseconds)”. 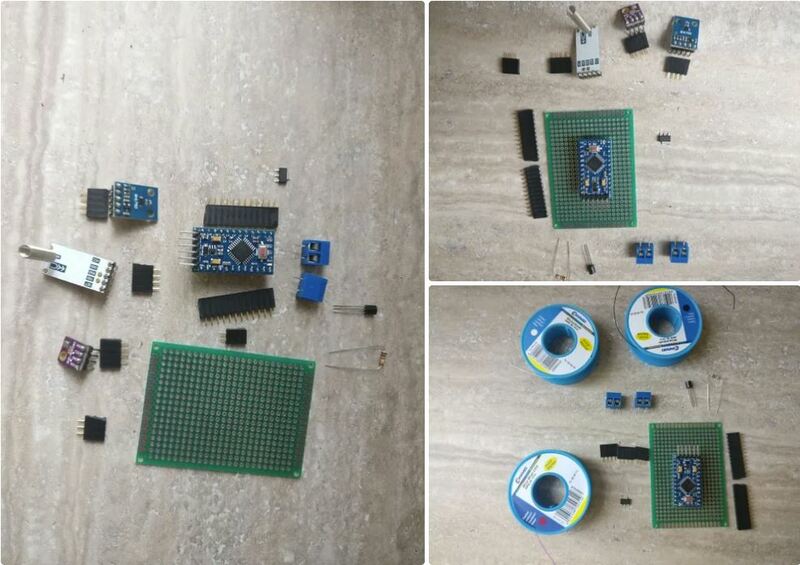 This will greatly increase the power consumption and decreasing the voltage rapidly. This effectively prevents the solar panel from overcharging the batteries. If you don’t know how to do that, check out this tutorial. The base station will consist of a linux computer (desktop, laptop or development board) with the HC-12 USB module attached. The computer must remain always on to collect data every 10 minutes from the station. I’ve used my laptop with Ubuntu 18. 2. Install mongoDb. MongoDb will be our main database for this project. It will store data about all the sensors time series. It’s schemaless and for our purpose it’s easy to use. I’ve used an older version of mongoDb 3.4.6, if you follow the tutorial above you’ll get exactly that. In principle it should work with the latest version. and you should get a list of mounted devices. The other config entries are some file default paths, no need for a change there. Here we’ll discuss basic stuff about importing my test data, running some tests on it, setting up your own data, displaying some graphs and setting up an email with prediction for the next few hours. A warning here, if you use my gathered data, and combine it with your newly local data the accuracy might drop because of the small differences in hardware (sensors) and local weather patterns. I’ll presume you have imported my data or “ran the script for a few years” to gather your personialised data, so in this step we’ll process the data to create a model used to predict future rain. It’s important to use the same parameters as in the train script above. For the email notification to work log in into your gmail account and Turn Allow less secure apps to ON. Be aware that this makes it easier for others to gain access to your account. You’ll need two email addresses, a gmail address with the above option activated, and an other address where you’ll receive your notification. As we talked earlier, the project has two separate parts. The weather station it’s self which only function is to collect and transmit data. And the base station where all the collection training and prediction will happen. The database stores data in BSON format (similar to JSON) so it’s easy to read and easy to work with. I’ve aggregated the data under an identifier that contains the date formatted as string to the minutes, so the smallest grouping here is a minute. The weather station (when working properly) will transmit a datapoint every 10 minutes. A datapoint is a collection of “date”, “humidity”, “pressure”, “temperature”, “rain” and “light” values. I’ve chosen python for the backend because many major inovations in neural networks are found in python. A growing community with a lot of Github repositories, tutorials blogs and books are here to help. * For the data processing part i’ve used Pandas (https://pandas.pydata.org/). Pandas make working with data easy. You can load tables from CSV, Excel, python data structures and reorder them, drop columns, add columns, index by a column and many other transformations. * For working with neural networks i’ve chosen Keras (https://keras.io/). Keras is a high level neural network wrapper over more lower level API’s like Tensorflow and one can build a multi – layer neural network with a dozen lines of code or so. This is a great advantage because we can build something useful on the great work of other people. Well this is the basic stuff of programming, build on other smaller building blocks. The scope of this tutorial is not to teach machine learning, but merely to outline one of it’s possible use cases and how we can practically apply it to this use case. Neural networks are data structures that resemble brain cells called neurons. Science discovered that a brain has special cells named neurons that communicate with other neurons by electrical impulses through “lines” called axons. If stimulated sufficiently (from many other neurons) the neurons will trigger an electric impulse further away in this “network” stimulating other neurons. This of course is a oversimplification of the process, but basically computer algorithms try to replicate this biological process. If you like to know more details about this process you can check out this article: https://mattmazur.com/2015/03/17/a-step-by-step-ba…. There are also numerous books and tutorials out there. One more thing, here we’ll be using a supervised learning method. That means we’ll teach the algorithm the inputs and the outputs also, so that given a new set of inputs it can predict the output. All of these things will give the network information for a datapoint, so for each of the 6 hours intervals these things will be known. 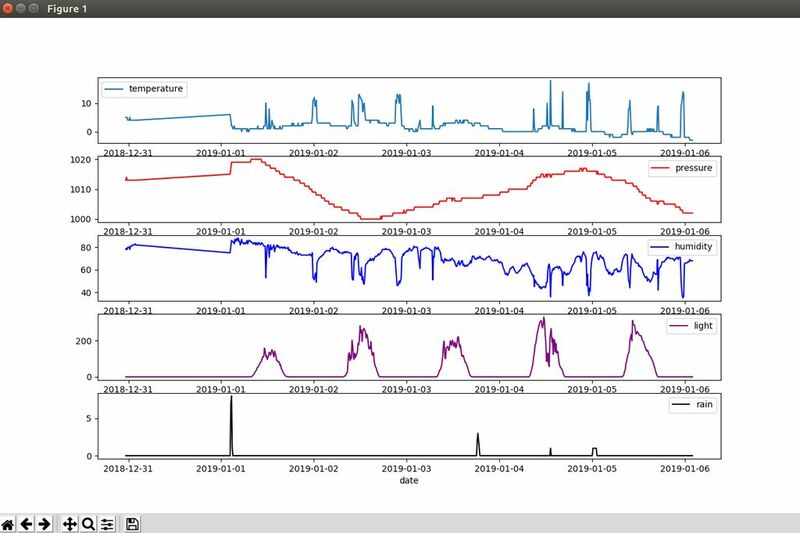 So you see that for every sensor let’s say temperature the following rows will be added: “temperature_1” , “temperature_2” .. meaning temperature on the previous datapoint, temperature on the previous two datapoints etc. I’ve experimented with this and i found that a optimum number for our 6 hour groupings in 8. That means 8 datapoints in the past (48 hours). 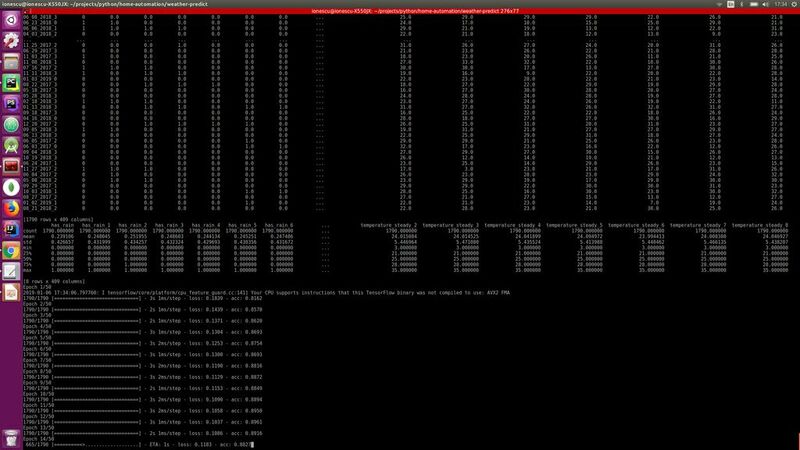 So our network learned the best from datapoins spanning 48 hours in the past. As you see, the first few columns has “nan” values because there is nothing in front of them so they should be removed because they are incomplete. Also data about current datapoint should be dropped, the only exception is “has_rain”. the idea is that the system should be able to predict “has_rain” without knowing anything but previous data. So what does this code mean? Here we’re building a sequential model , that means sequentially all the layers will be evaluated. b) a Dropout layer is added. To understand the Dropout first we must understand what “overfitting” means: it’s a state in which the network has learned too much particularities for a specific dataset and will perform badly when confronted to a new dataset. The dropout layer will disconnect randomly neurons at each iteration so the network won’t overfit. – optimiser functions (rmsprop). It optimizes how the model learn through backpropagation. There is no best configuration for any network or dataset, all these parameters can an should be tuned for optimal performance and will make a big difference in prediction success. This will search through different “batch_size”, “epoch”, “optimizer” and “dropout” values, evaluate all and print out the best combination for your data. If you have some feedback on my work please share it, thanks for staying till the end of the tutorial!